Our 4 seater sofas offer a generous amount of space to stretch out. Discover beautifully crafted large sofas in fabric and real leather. 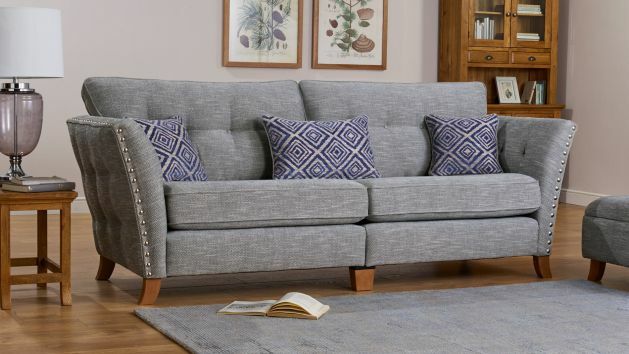 Our stylish 4 seater sofas are designed to help you make the most out of your living room. The spacious designs accommodate up to four people and boast ample space to put your feet up; perfect for families, houses with lots of guests, or those who just love to spread out. We have a range of signature styles that will serve as your trusty living room staple for many years to come. All our large sofas are made to the highest standards. We only use high-quality construction methods, so you can be confident knowing your sofa will keep its good condition over the years. The durable frames are built with solid hardwood at all stress points and the joints are screwed, glued, and pinned to strengthen them and prevent warping or bowing over time. The seats are supported with special serpentine springs and even feature silencing joints so your 4 seater sofa doesn’t squeak. All our large sofas feature our exclusive seat cushion designs for easy maintenance and excellent shape retention. You can spread the cost of your new large sofa with our flexible finance options, designed to make decorating your home with our beautiful furniture more affordable. For purchases over £500, spread the cost by paying monthly over up to four years. And for orders over £3,500, enjoy interest-free credit up to three years. Fast delivery (seven working days) means there’s minimal waiting time - you can create your dream living room right away. Browse our full selection of 4 seater sofas, delivered free by our friendly delivery crew to your room of choice. Don't forget to complete the look with one of our matching footstools.